Your faithful correspondents are going to be not so faithful for the next two weeks. NCN will return to our regular schedule on January 5, 2009. Until then, please feel welcome to browse in our archives, and be sure to scroll down this page to see the slide show by Patrick Andrade that went up on December 19. It has been quite a year, and John and I are grateful to have been able to contribute to the ongoing discussion of politics and visual culture. There are many reasons for doing anything, but we want to be sure to acknowledge the continued attention and occasional comments by our many readers. If you drifted away, we probably would pull up the tent and move on. Thanks to each of you for keeping this blog alive, and best wishes for the new year. 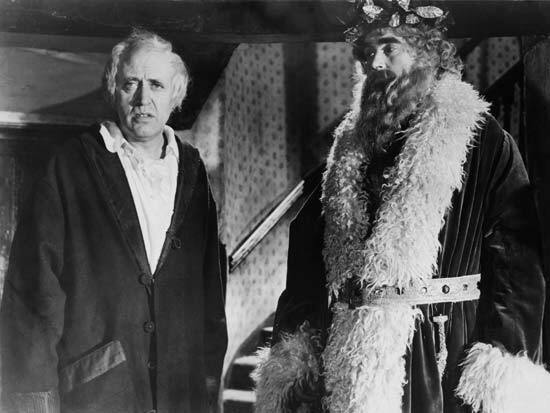 Photographic still of Scrooge (Alastair Sim) and the ghost of Christmas Present, from Scrooge, the 1951 adaptation of Charles Dickens’ A Christmas Carol.